Get Out and Enjoy the Water! The Pioneer-Sarah Creek Watershed Management Commission is the regional governmental unit responsible for protecting the water resources of the Pioneer-Sarah Creek watershed. We invite you to browse our site using the tabs along the top of the page. ​The Pioneer-Sarah Creek Watershed Management Commission meets at 6:00 p.m. on the third Thursday of each month. Meetings are held at the Discovery Center, 5050 Independence Street, Maple Plain, MN. The agenda is updated seven days prior to the meeting. The Lake Sarah CD3 Outpost was installed yesterday! The City and the Lake Association will be given access to view the use data. ​Last night, I was heading to the dog park around 6:30pm. There was a fishing boat parked right at the CD3 station. I told him he may be the first ever user. He mentioned that he has seen these units at Long Lake and really like the grabber tool to get the weeds from under the boat. Fun to see it used already! Also, a reminder to me on how much the boating community moves around from lake to lake looking for those big pan fish! Notice of Availability and Request for Comment on Draft Pioneer-Sarah Creek Watershed Restoration and Protection Strategies (WRAPS) and Total Maximum Daily Load (TMDL) Reports is open for formal public comment through May 31, 2017. For more information, visit the MPCA Public Notices webpage. Lake Sarah is a highly utilized and valued public resource in the Pioneer-Sarah creek Watershed. In 2011 the Pioneer Sarah Creek Watershed Management Commission, in partnership with the Minnesota Pollution Control Agency (MPCA) and Three Rivers Park District (TRPD), completed a Total Maximum Daily Load (TMDL) analysis to quantify the phosphorus reductions needed to meet state water quality standards for nutrients in Lake Sarah in accordance with the Clean Water Act. The study identified the Dance Hall Creek watershed as a "hot-spot" for contributing nutrients to Sarah Lake. Dance Hall Creek drains to Sarah Lake which drains via Sarah Creek to the Crow River. 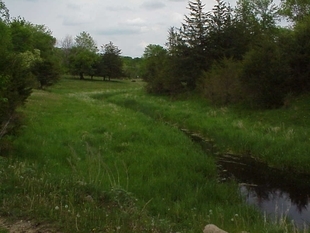 In 2013 the Hennepin County Environmental Services Department (HCES) performed a stormwater retro-fit study for the Dance Hall Creek watershed within the City of Greenfield. The study was a partnership between the HCD, HCES, City of Greenfield, and Crow River Watershed Association. Data from the study will be utilized by the partners to seek Clean Water Legacy BMP funds. This report details urban and rural stormwater assessment studies and Best Management Practices (BMPs) recommendations within the City of Medina to reduce phosphorus loads flowing into Lake Independence and Lake Ardmore. Since different types of BMPs must be utilized in order to be effective for the urban and rural portions of the watershed, the report is organized in two sections. The first section analyzes the residential urban area that it situated between Lake Independence and Lake Ardmore and drains to both basins. The second section analyzes the rural subwatershed that drains to Lake Ardmore and ultimately to Lake Independence. The rural portion of this assessment is approximately 472 acres in size – 423 in the city of Medina and 49 in the City of Independence. The developed community studied for this assessment is 113 acres and located in Medina between Lake Independence and Lake Ardmore. The purpose of the Ardmore Area Subwatershed Assessment is to assist the City of Medina in its decisions and processes to provide cost effective methods to help reduce phosphorus loads into Lake Ardmore and Lake Independence from these two subwatersheds.